“The Walls Are Rising” — FOUND! Last month I wrote about “The Walls Are Rising,” a film about the city’s desperate need to address shortcomings in its planning and development if it wanted to avoid an urban crisis which some felt was fast-approaching. The film had been produced by the Dallas chapter of the AIA (American Institute of Architects) in 1966/67, and it was shown to numerous civic and professional organizations. When I read that the film began with an assault of images and sounds followed by an ominous and stern voice saying, “We are living in an accident,” I knew I had to see it. Also, as the film touched on many of the same city planning issues we are still debating almost 50 years later, I knew that it would have a certain amount of news value. If *I* wanted to see it, I felt sure others would, too. I stumbled across mention of the film in early November of last year and researched it as much as I could using various online sites and databases, but I could find nothing about it after its initial barnstorming tour through the Dallas civic club scene between 1967 and 1972. I contacted the Dallas Municipal Archives and the Dallas/Texas history department of the Dallas Public Library, but neither had any info. I contacted AIA Dallas/Dallas Center for Architecture, and they weren’t familiar with the project either, but Jan Blackmon (Executive Director of AIA Dallas/DCFA) and Greg Brown (DCFA Programs Director) were both extremely enthusiastic and set out to find it. And now they’ve found it. To be more precise, it was AIA’s Anna Procter who tracked down a copy of the film. 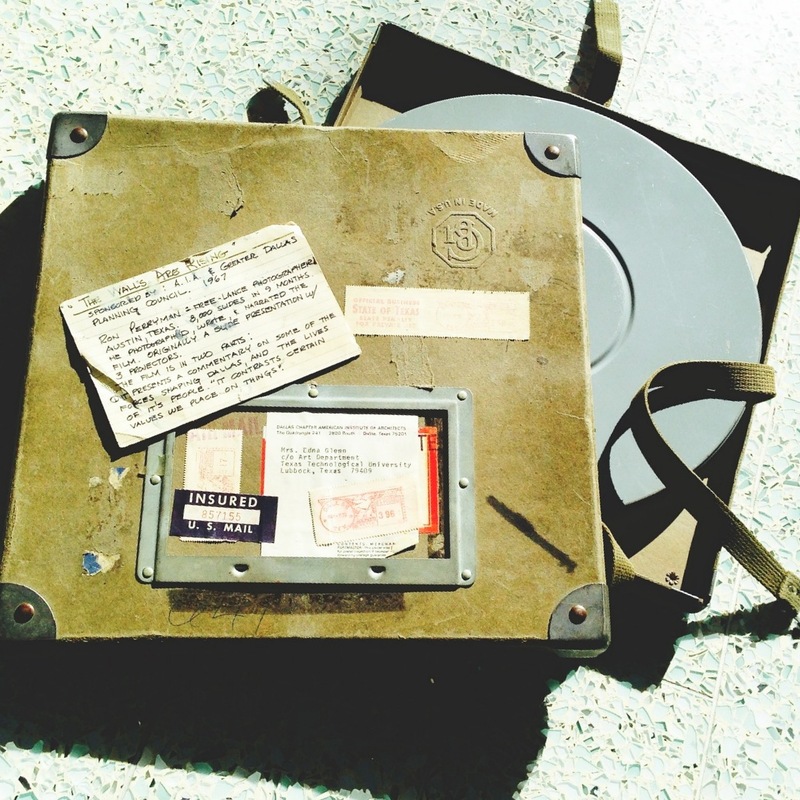 Her dogged detective work resulted in not only finding a copy of “The Walls Are Rising” (still on a reel), but also finding other archival material concerning AIA concerns regarding the city’s urban planning and development issues of the late-’60s — a little treasure trove of cool stuff. An enthusiastic article about the film by Robert Wilonsky of The Dallas Morning News (who will also be moderating the panel on Jan. 19), can be found here. Sometimes spending my days wandering through virtual archives and blowing virtual dust off virtual files pays off. 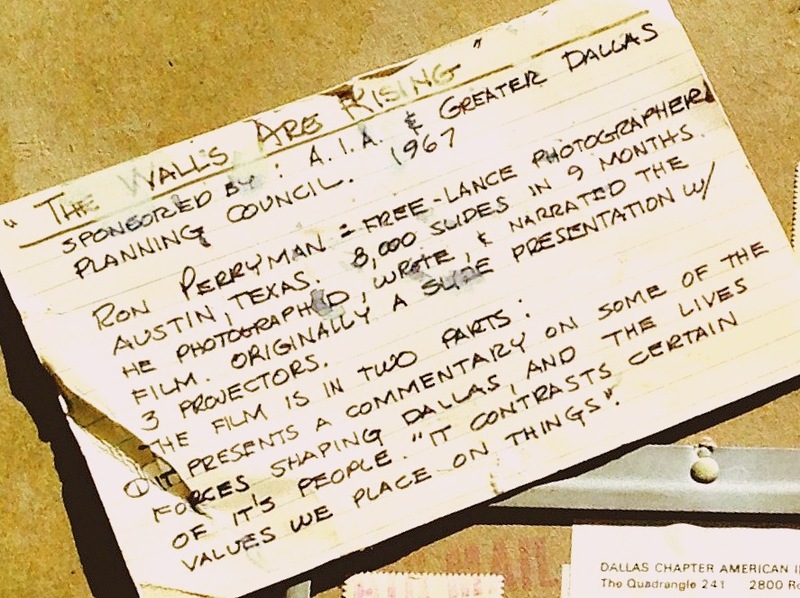 I look forward to seeing “The Walls Are Rising,” and I’m so happy to have played a part in the unearthing of a forgotten part of Dallas’ history! Images used with permission of AIA Dallas. My original post, “Urban Crisis — 1967,” is here. Filed Under: 1960s, Architecture/Significant Bldgs.